As we continue our week by cleanly welcoming Spring I bring to you a new blog that you must check out. Living Well Spending Less is especially great for a family but just as great for the single and married sans kids of us out there. I am sharing a fantastic printable with you today thanks to Ruth. Back to cleanly welcoming Spring! I can't get over how happy I am that I found this printable. Not only does she give you recipes but she also includes a handy shopping list! Laurie and I are all about living cleaner lives. We tend to focus on eating clean a lot but cleaning clean is also highly important. 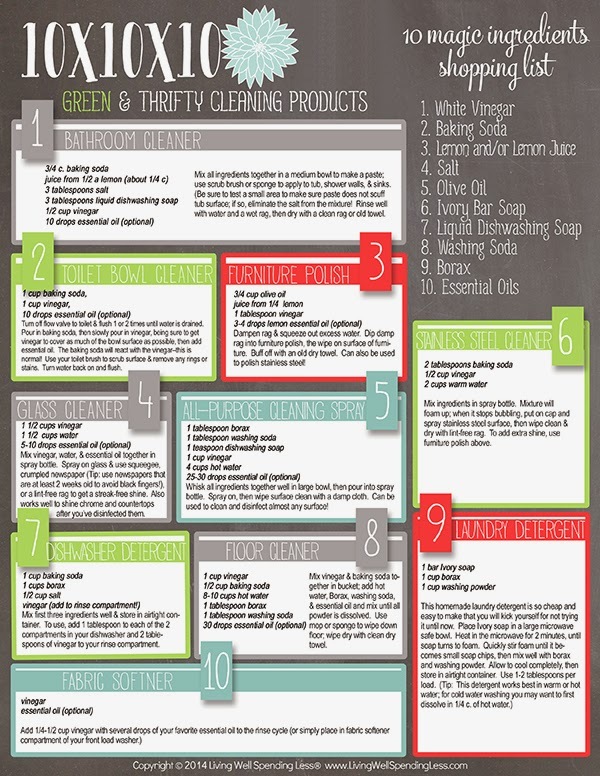 Just because we eat fewer chemicals doesn't mean we can use more when we clean our home. I have done the make your own laundry detergent before but this recipe is made in a completely different way and I WILL be trying it. The ivory soap in the one I make is really hard and doesn't dissolve in the wash and then my clothes have little pieces of soap melted on them thanks to our dryer that reaches scorching temperatures (someone, anyone, send me a new dryer -- I can't complain, ours is free). Also super excited to use the glass and surface cleaner recipe. And the toilet bowl cleaner...it sounds kind of fun. I'm not going to lie. Keep in mind, spring cleaners, as you finish off your store-bought chemical cleaners (like I will as well) hold on to your spray bottles. Rinse them out with a mixture of hot water and vinegar to clean them and then add your "thrifty" cleaners. From what I can tell vinegar cleans everything. P.S. Real Simple has a ton of great tips too!